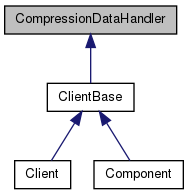 An abstract base class used to receive de/compressed data from a CompressionBase-derived object. Definition at line 32 of file compressiondatahandler.h. Definition at line 38 of file compressiondatahandler.h.